The West Portal neighborhood is at the, uh, west end of the, uh, portal that was built from the center of town outwards for the underground trolleys. 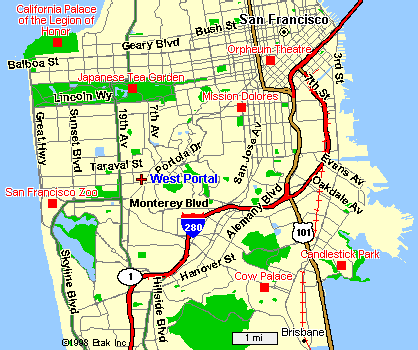 It's a pleasant place to stroll, especially if you're interested in going westwards, to Ocean Beach, the San Francisco Zoo, and Leon's Bar-B-Que (from the French phrase "[goat's] beard to tail"). A detailed accounting of the contents of this weblet is available.